In six hours’ time, A Soyuz rocket will blast of from Guyana with the hope of delivering a €1billion Christmas present to astronomers across the world. 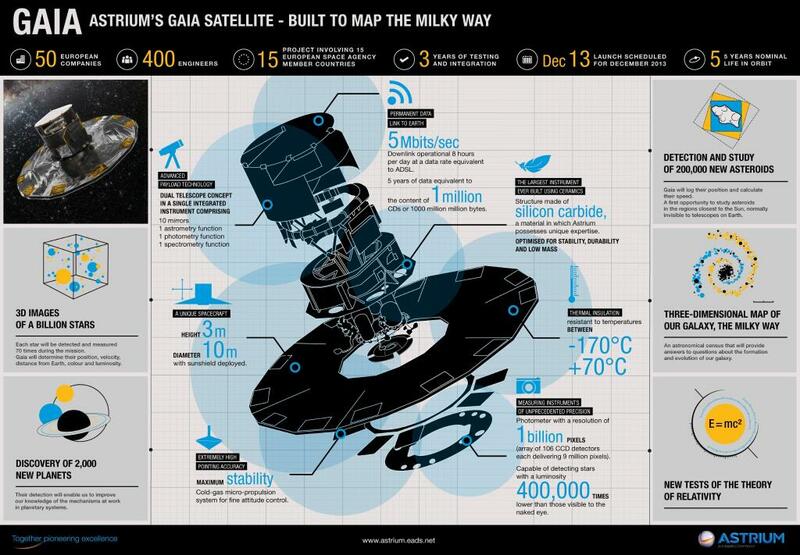 That present will be Gaia, ESA’s flagship science mission, which hopes to revolutionise how we look at the galaxy around us by providing a 3D map of a billion stars and finding hundreds of new exoplanets. So what is Gaia? It is essentially the most sensitive camera ever to be pointed at the heavens. That may sound the same as most space telescopes, but its specifications mean it will be able to pinpoint the location of stars with accuracy previously only dreamed of. Using a 1.5m mirror and a Gigapixel CCD camera, it will image more than a billion stars at least 70 times over a 5 year mission to provide the most accurate catalogue of stars in the Milky Way ever seen. It is not the sensitivity of the telescope that is extraordinary, however, but rather its angular resolution. Consider the previous such mission, Hipparcos. It was capable of resolving objects tens of thousands of times closer together than the human eye, for example even from 200km away, it’s camera was capable of spotting two lights placed only a millimetre apart. This corresponds to the order of milliarcseconds, or 1/3600000th of a degree. Gaia, on the other hand, will be able to resolve stars mere microarcseconds apart. That is equivalent to being able to read 20pt text from 30,000km above Earth, or resolving two bright lights only 170m apart at the distance of Pluto. What this amazing technological shift means is that Gaia will not only be able to compile the most accurate catalogue of star positions in history, it will also be able to map them in 3D. It may seem strange, but measuring the distance to a far-away point source like a star is nearly impossible. For nearby stars the shift of Earth’s position during the course of the year can act as a sort of cosmic depth perception, with the location of nearby stars wobbling subtlety between July and January, depending on how far away they are. It is this Parallax effect that, thanks to the incredible resolution of Gaia, will enable the distance to 1% of the stars in our galaxy to be precisely measured. But when this effect due to the motion of Earth is corrected for, what motion is left? It’s likely the star will be moving in some direction through the galaxy relative to our solar system. This straight-line speed is the star’s ‘proper motion’ and can be as high as 10.3 arcsecs per year. But that’s not the only thing Gaia might spot. Stars are also tugged at by the gravitational pull of all nearby objects. This is most prominently done by planets in the stars vicinity. For example, an observer 30 lightyears away would see the sun shift by nearly 500µas due to the orbit of Jupiter. That means Gaia would see the Sun perform a slow ellipse across the sky every 5 years each time Jupiter orbits. The biggest signals come from Gas Giant planets circling far from their stars, and Gaia will be able to search the nearest 400,000 stars for such worlds. Due to its 5-year mission, it will find these Jupiter analogues between 1 and 4AU. With any luck, more than 1000 candidates will be found; potentially doubling the current crop of exoplanets. And with Kepler dead and TESS still on the drawing board, Gaia may well become our best tool to mine the skies for new planets. Another remarkable feat that Gaia will be able to achieve is pinning down the exact mass of some exoplanets. Worlds discovered by radial velocity give us an estimate of their size based on the to-and-fro motion of the star due to planets. Astrometry by Gaia will be able to give the side-to-side motion and determine in what precise inclination the planets are in. By tying down the planets orbit like this, their mass can be precisely determined. Gaia, if successfully launched in the next few hours, will be capable of incredible feats. First and foremost, it’s incredible parallax measurements will turn astronomy from a two-dimensional star map into a complex three dimensional system where the distances to almost every object is known precisely. And tagged on for free are another thousand potential exoplanets to add to the exponentially growing list of alien worlds! If all goes well in Guyana at 9am, a collective sigh of relief will emanate from astronomers worldwide, and it might just signal the start of a new era of astronomy.